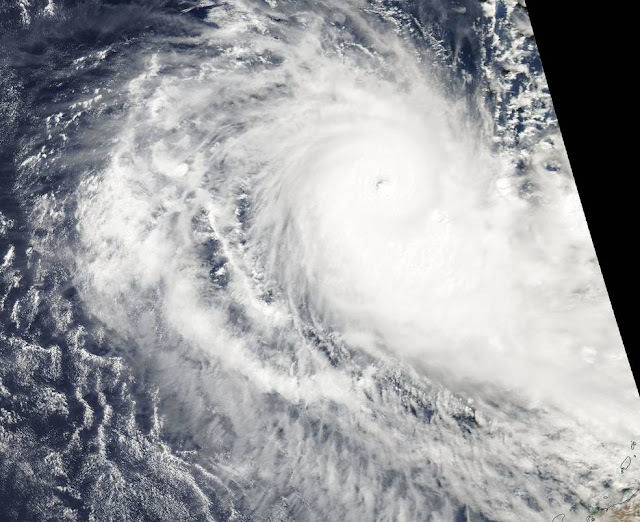 www.facebook.com NASA's Aqua satellite passed over Ernie on April 7 at 0645 UTC (2:45 a.m. EST) and the Moderate Resolution Imaging Spectroradiometer or MODIS instrument took a visible image of the storm. The image showed an eye had formed as the storm strengthened into a hurricane. Thick bands of powerful thunderstorms surrounded the eye. At 0900 UTC (5 a.m. EST) on April 7, Ernie's maximum sustained winds were near 95 knots (109 mph/175 kph). It was away from land areas, about 467 nautical miles (538 miles/865.5 km) north-northwest of Learmonth, Western Australia. It was centered near 15.4 degrees south latitude and 110.3 degrees east longitude. Ernie is moving to the south at 5 knots (5.7 mph/9.2 kph). The Joint Typhoon Warning Center expects Ernie to move in a south-southwesterly direction and weaken.